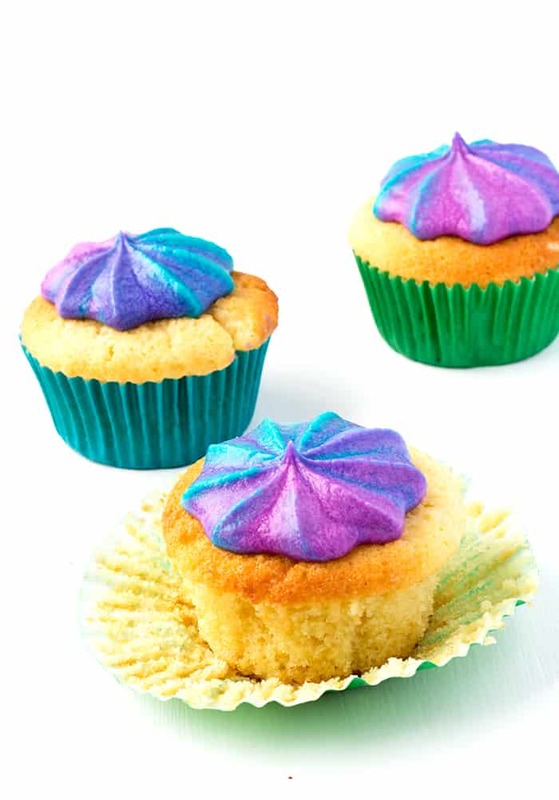 These Vanilla Cupcakes with Swirled Rainbow Frosting are light and fluffy, with a tender crumb, thanks to a little sour cream. 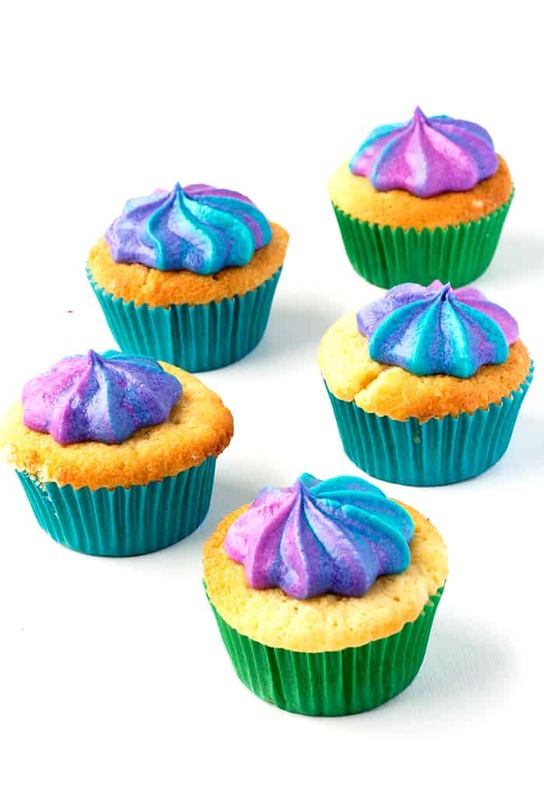 Decorated with a dollop of rainbow-coloured vanilla buttercream, they are the perfect party cake! Ever since I made my Purple Marbled Vanilla Layer Cake, I have been obsessed with coloured buttercream. I just love the swirled galaxy colours that come from using three different types of buttercream – and the options are endless! It has taken me a long time to find, what I think, is the perfect vanilla cupcake. There are so many ways to make a vanilla cupcake but there are also too many bad vanilla cupcakes in the world. But i think I’ve finally found my favourite. 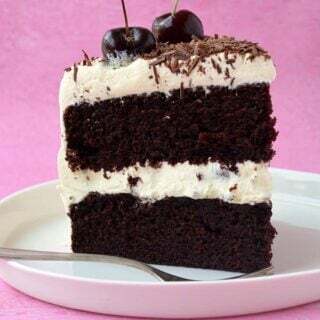 It’s light and fluffy, moist without being too moist and is good enough to eat on its own – sans frosting. I’ve mentioned before that my new weapon to use in cake-making is sour cream and here it is again. Just that little bit of tangy sour cream makes a world of difference – just like buttermilk can, but even better I think! Once you have you two or three colours, you just add each one, one at a time, to the same piping bag. You can try to keep the colours from completely mixing, but honestly, there is no rule here. Once you start piping, each of the colours start appearing and each swirl turns our even prettier than the one before. My only advice when it comes to colouring buttercream, is to use good quality food gel rather than food colouring. Generally food colouring is not as strong, which means you have to add a lot more to achieve vibrant colour. 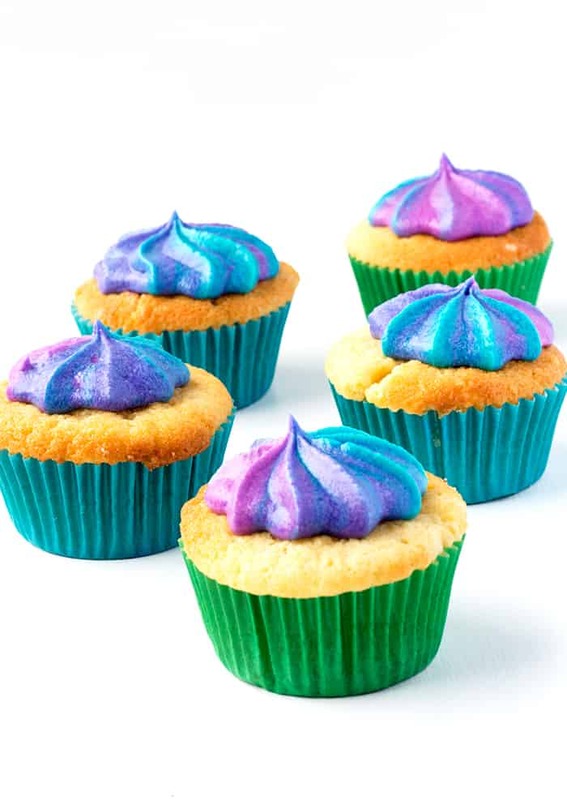 Your buttercream can then become too liquid and limp – making it hard to pipe. But food gel, on the other hand, works perfectly. I hope you had a great weekend! There was sunshine and blue skies for us so we managed to squeeze in a little beach time. Breakfast with ocean views is always a good idea. 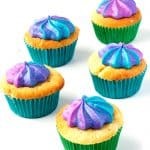 Well it’s time for me to head off to work but please, try these cupcakes if the baking urge hits! 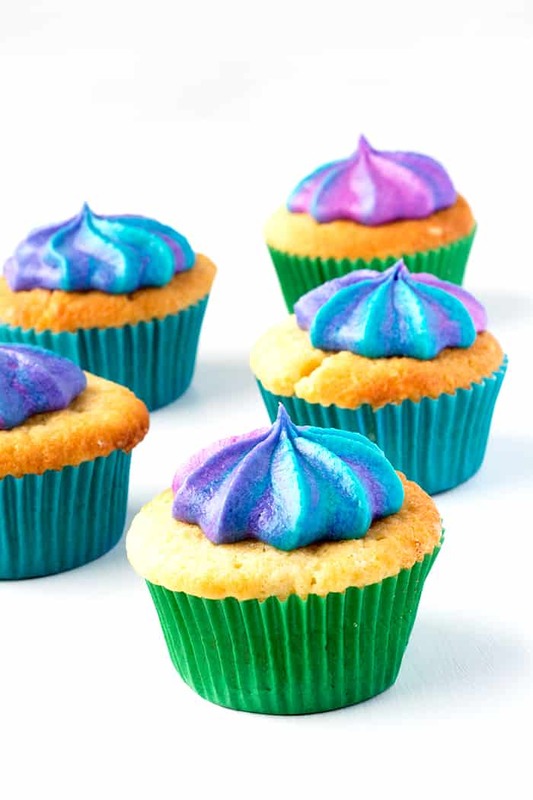 Light and fluffy Vanilla Cupcakes with Swirled Rainbow Frosting with a tender crumb, thanks to a little sour cream – and a dollop of vanilla buittercream. Three different coloured food gels – I used purple, teal and violet. Preheat the oven to 160 C (320 F). 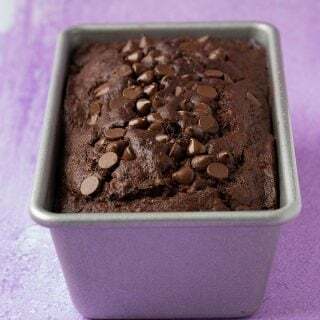 Line a 12-hole muffin pan with cupcake liners. In a large mixing bowl, beat the butter and sugar together until pale and creamy. Add the vanilla and beat again. Add the egg, beat again, then scrap down the sides. In a separate bowl, sift the plain flour and baking powder together. Add half of the flour mixture to the butter and half of the milk and slow mix together on a low speed. Add the rest of the flour and the milk and continue to mix until combined. Finally, add the sour cream and mix until smooth and creamy. Pour the cake batter into your prepared tin and bake in the oven for approximately 18-20 minutes Leave to cool completely on a wire rack. To make the icing, add the butter to a large mixing bowl, beat with an electric mixture until soft and creamy. Gently sift in one cup of the icing sugar and continue to beat. Add a tablespoon or two of milk to help loosen up the mixture. Add the rest of the icing sugar, one cup at a time. Continue to add a tablespoon of milk as needed – but be careful, you don’t want the frosting too runny. It should be nice and creamy but thick enough to hold its shape when piped. Divide the icing into three bowls. 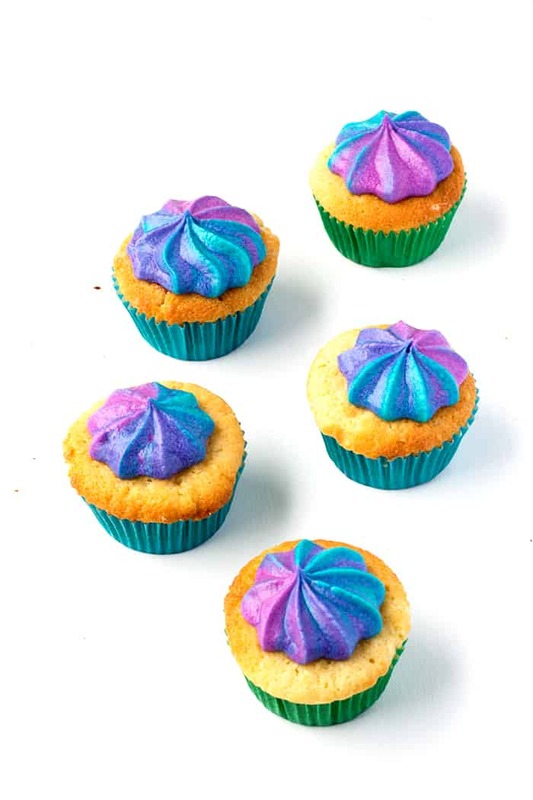 In each bowl, add a few drops of food colouring and stir thoroughly until the icing is dyed to the colours you want. Grab your disposable piping bag and insert a large star tip into the end. Very gently add spoonfuls of one colour of icing and try keep it to one side of the piping bag. You don’t have to be exact, so do the best you can. Then gently spoon the second coloured icing on top and then the third colour on top of that. Gently press down to remove any air bubbles and force the icing down to the tip. Twist the top of the bag and then pipe the icing onto the cupcakes. 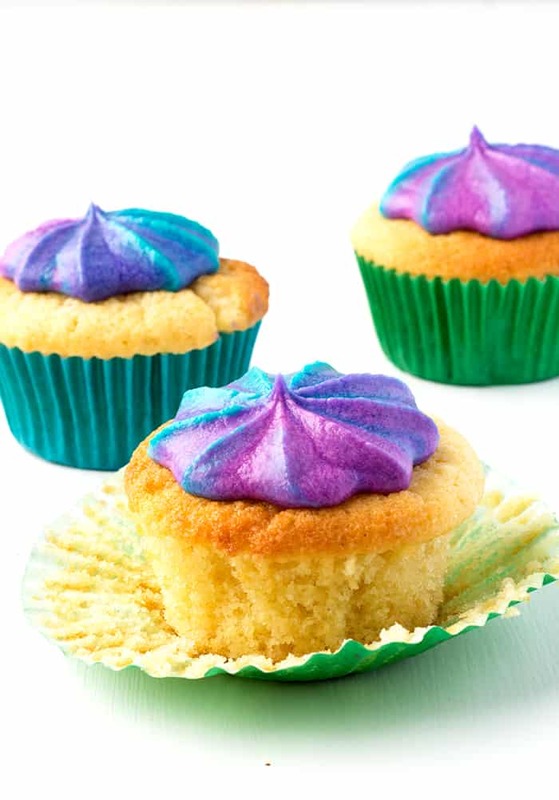 The first time you use pipe the frosting, it probably won’t have all three colours so use that one as a test run. Sent my son off to school with a batch of these this morning for a school fundraiser. I am hopeful he won’t eat too many on the bus. Sprinkled some pink sugar crystals over the top for added glitz. He was very content. These are so happy and cool and awesome! I cannot tell you, how many vanilla cupcake recipes I have tried only to be disappointed… too dry, too dense, too sticky.. I lack the vocabulary!! It amazes me, because isn’t it a basic? besides chocolate cupcakes? 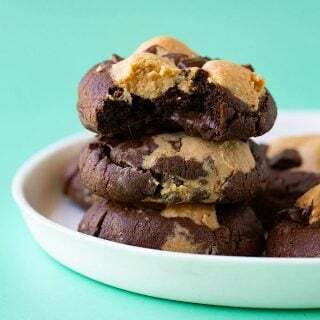 Will give these a try for sure! I feel the same way Jenny! But it just means when you get right, you are extra excited! 🙂 I hope you enjoy these vanilla cupcakes. Oooh! Everyone needs a fluffy vanilla cupcake recipe and these look so perfect! Amen to that! Vanilla cupcakes are the best! Aww thanks Amy! I know right? Sour cream is like magic!